The MirrOlure® Spotted Trout resembles a trout fingerling, a natural baitfish for inshore game fish. The TT features "built-in" spots which will not scratch. TT can be cast or trolled to catch giant speckled trout and redfish. MirrOlure� TT Spotted Trout Sinking Twitchbait swimming action: darts from side to side with a live bait action while emitting a sonic fish calling sound. I've got a box full of these and the STTR. 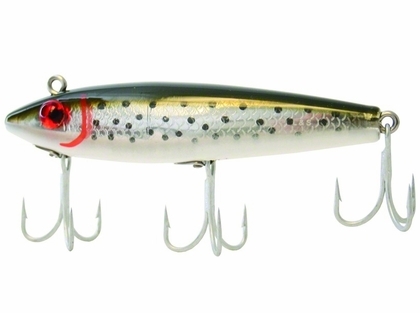 Very effective surf lure, takes some time to get the action down but deadly. And they last forever, some are 20yrs old...add new hooks and feed a fish. We do not stock that color, but we can add them.